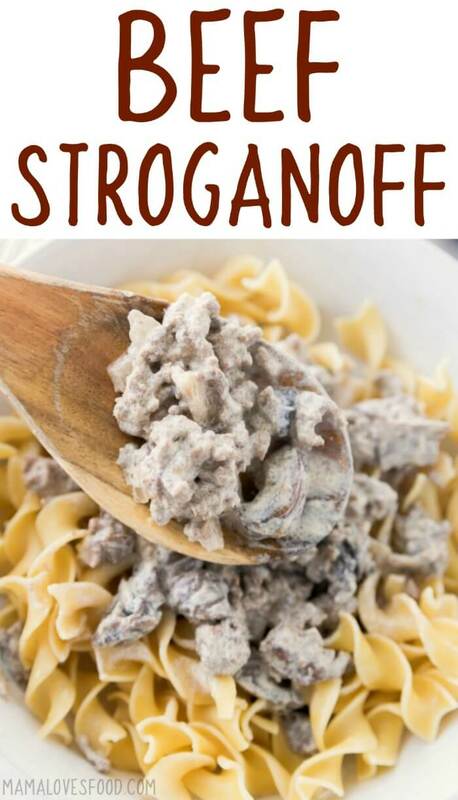 This easy Ground Beef Stroganoff recipe made with ground beef and sour cream is a great quick weekday dinner idea! 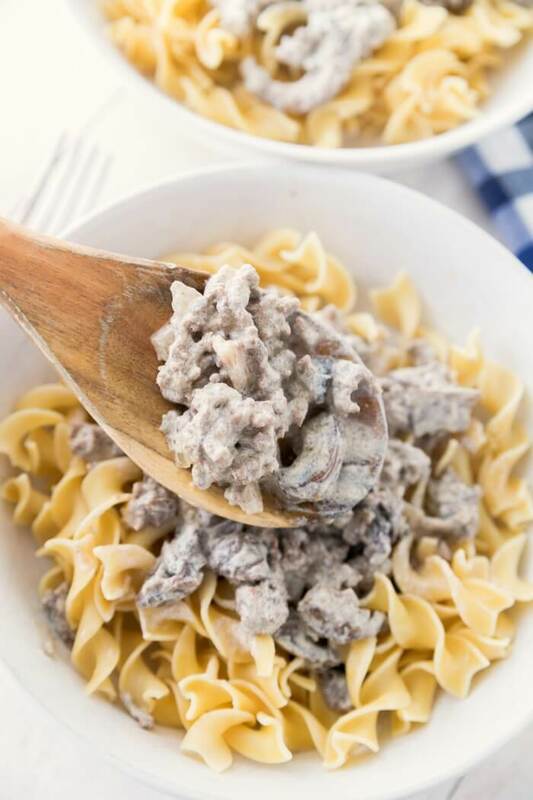 Ground beef stroganoff made with ground beef is a super simple and incredibly flavorful meal. In our home it’s a hit with all five kids! You can serve the ground beef stroganoff over traditional flat egg noodles, or mix it up a little and use whole wheat noodles, or even zucchini noodles! I like to serve this simple recipe alongside our three ingredient peanut butter cookies. Mmmmm. How do you make a ground beef stroganoff? We make our ground beef stroganoff on the stovetop. It comes together super quickly because there are only a handful of ingredients. Depending on what cut of beef you use, it can be done in as little as fifteen minutes! The backbone of a good hamburger stroganoff is going to be the sour cream base, so I implore you not to use the fat free or low fat stuff. Indulge in a rich an velvety sour cream. You won’t be sorry. 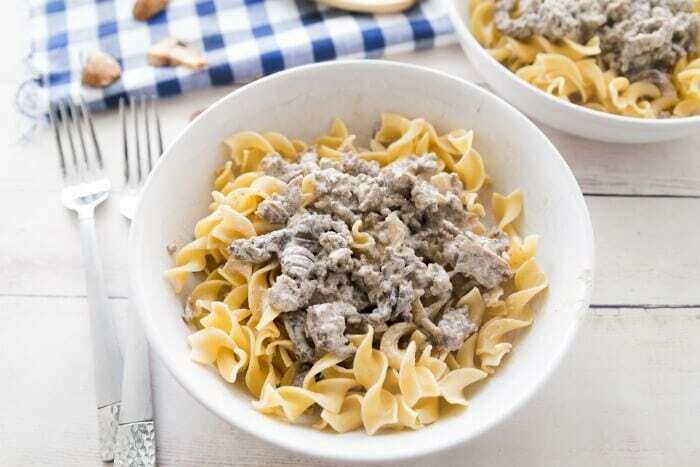 What is the recipe for ground beef stroganoff? 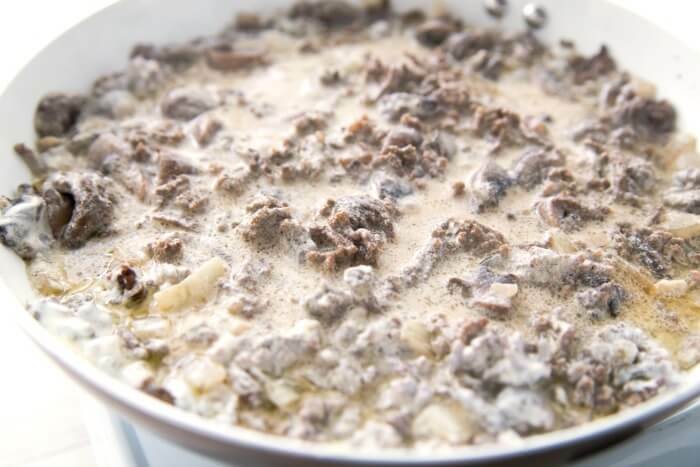 We use a combination of ground beef, onions, mushrooms, beef boullion, and sour cream for our ground beef stroganoff. It really is that basic. But sometimes basic is delicious. My kids like ground beef stroganoff served over egg noodles, but I like it just in a bowl with a spoon or on top of a baked potato! What is the best cut of meat for beef stroganoff? Traditionally ground beef stroganoff calls for rump or round steak, because classically the dish was a low cost beef dinner. 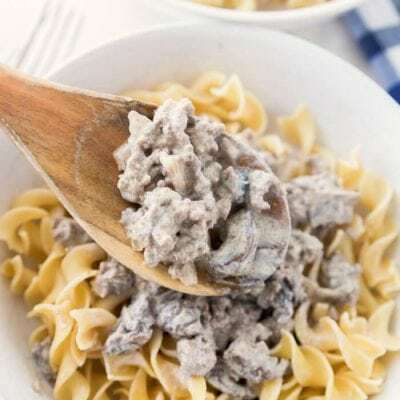 Ground beef is used in our beef stroganoff recipe because it’s inexpensive, easy to prepare, and quick. And busy people need something that cooks faster than rump or round steak (but still tastes awesome). It’s fast and yummy. The perfect dinner combination. How do you serve ground beef stroganoff? 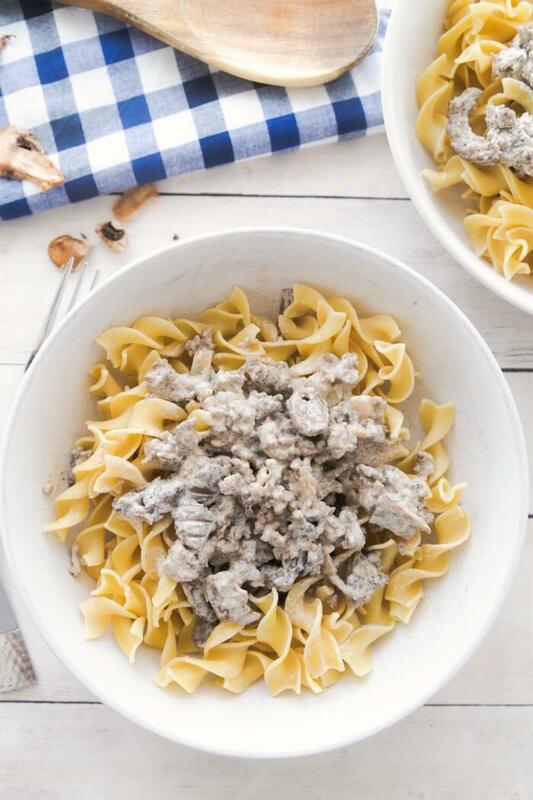 There are so many ways to serve ground beef stroganoff! My personal favorite is over a baked potato or over some zucchini noodles. My kids like it over egg noodles, which is the traditional way to serve beef stroganoff. Sometimes I even get a little crazy and serve the beef stroganoff in a bowl with potato chips. Mmmmm, so good. Cheeseburger Soup – This cheeseburger soup made with ground beef, cheese, and potatoes is the ulitmate yummy comfort food. And you can make a big batch and freeze it for later when you want comfort without the work. The Ultimate Loaded Burger Salad – Loaded Burger Salad, for when you want to be healthy, but not really. Hey though, with this one you can tailor it to suit however you’re eating, so yay! Don’t forget the dill relish! Loaded Cheeseburger Skewers – Make these loaded cheeseburger kabobs with meatballs or cut up hamburger patties. So fun for a party! My kids like any kind of food on a stick. Are yours the same way? Spicy Chipotle Cheeseburger Dip – Cheeseburger dip is sooooo yummy! I love eating it with Fritos! This dip is spicy, but you can skip the heat if it’s not your thing. Slow Cooker Beef Chili – Classic beef chili made in the slow cooker is the ultimate Sunday meal. Don’t forget the corn bread! Check out these Amazon affiliate links for kitchen tools we love! Lodge Cast Iron Combo Cooker – Did you know cooking in cast iron actually ads iron to your food? Also cast iron is non stick and virtually indestructible. We love love love our cast iron pots and pans! Colorful Porcelain Bowls – I just love pretty bowls. If you’ve watched our live cooking program, you know I have quite the assortment of colorful bowls! 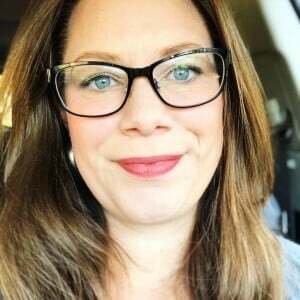 6 in 1 Instant Pot – Did you know the Instant Pot can act as a pressure cooker, a slow cooker, and a regular old pan to saute? It’s fantastic and we use ours all the time! Brushed Stainless Steel Ladle – It makes me a little crazy when I visit someone and they don’t own a ladle. I want everyone to have a ladle. It also makes me feel sad. Obviously you’re not as into scooping things as I am if you don’t own a ladle. Hah! Stainless steel mixing bowls – Classic, basic, mixing bowls that everyone should have in your kitchen. You’ve seen me use them on the cooking show at least seventy bajillion time. Ish. You can also watch us make this Ground Beef Stroganoff on Youtube! Make sure to tune in for all our live cooking shows! 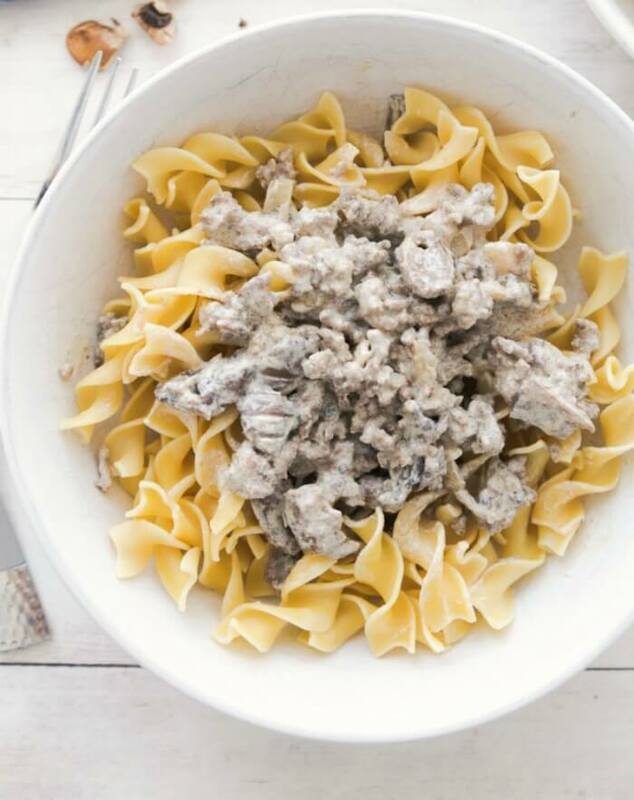 This easy ground beef stroganoff recipe made with ground beef is a great quick weekday dinner idea! 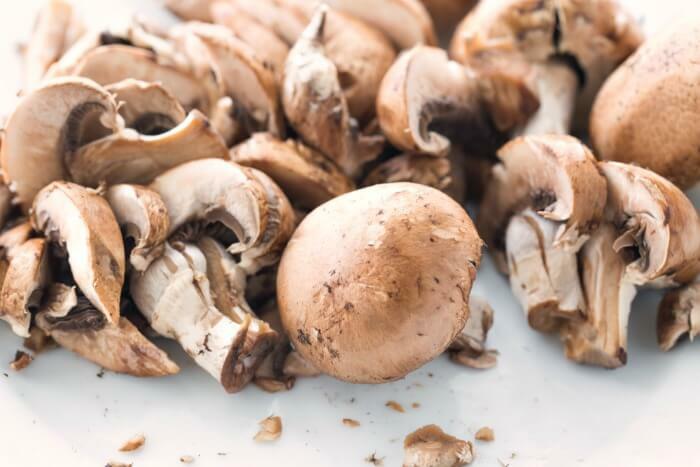 Using a large pan, saute onion and mushrooms in butter or oil until onion is translucent and mushroom is becoming limp. Add garlic and saute for another couple minutes. Add ground beef, sour cream and bouillon. Stir until well mixed and cook on medium/low until hot throughout. Spoon over noodles and enjoy! Calorie calculation does not include noodles. I love the idea of whole wheat noodles. My family only eats them when I serve with a good sauce. If they can taste the noodle they balk. I bet this recipe would mask the taste nicely. Thank! That looks and sounds delish. I love beef stroganoff. It was so great spending the weekend with you at the Food Blog Forum. Made this tonight – and it was another crowd pleaser! Mom and Dad came to visit – loved it, and husband liked it so much he ate about 3 servings. I did try a new product – rather than the bullion you suggested, I used the new Knorr's concentrated beef broth and dropped it right in with the sour cream. I think it really was a nice touch. I also used a white truffle and garlic olive oil to sautee the onions. I must say – this dish was amazing. I am totally craving this now!